Please note that the SW band for the tour will change between the European and American legs. The line up for all of the European shows will be the same as on the forthcoming album: Guthrie Govan – guitar, Adam Holzman – keyboards, Theo Travis – flute/sax, Nick Beggs – bass, and Marco Minnemann – drums. However, due to another touring commitment, Marco is unable to join the band on the North / South American leg of the tour. Sorry as I am to not have Marco for the whole tour, I’m very happy to announce that Chad Wackerman will be taking over the drum stool for these shows. 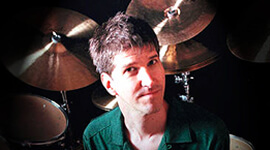 Chad is perhaps best known for being Frank Zappa’s drummer for 7 years in the eighties, until Zappa’s retirement from live performance, but he is also a composer and band leader in his own right, and has performed with many other high profile artists. Needless to say Chad is an extraordinary musician who will bring his own talents and unique style to the SW band.